For the Aditya Birla group this is a first. Although it has trekked down the acquisitions route to build its fashion empire in the past, be it the buy-out of rival Kishore Biyani's Pantaloons, or the numerous foreign labels under Madura, the group has steered clear of fast fashion. 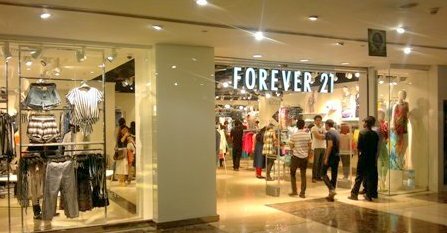 But with the Rs 200-crore purchase of Forever 21, the group has finally forayed into this big, but notoriously fickle market. "If you look at fashion globally, fast fashion is largest part of the market. In India also, more women are moving towards western wear. Forever 21 is a renowned brand and its proposition is attractive. It is important for us to expand the portfolio and grow the brand in the long term," said Ashish Dikshit, business head, Madura Fashion & Lifestyle at Aditya Birla Fashion & Retail in a telephonic interview with Business Standard. But can Forever 21 deliver the results it is expected to, especially since it competes with global giants Zara and H&M? Both have tweaked their value proposition for India, offering affordable fashion for price conscious local consumers. Forever 21 entered the country in 2010 with Sharaf Retail, but failed to scale up operations. In 2013, it forged a partnership with DLF Brands to open 40-50 stores in five years in the country, but these plans too hit a roadblock. Currently, the brand has 12 stores and a small online presence and it has been in the hunt for a new partner for a while. In India, the label targets the young urban woman and not just the teen-market. "The partnership will help establish Forever 21 as one of the largest women's wear brand in the country," says Jatin Malhotra, director, global expansion, Forever 21. The Birla group seems to be looking at a similar goal. Dikshit said they would not look at tapping synergies between Birla's fashion units and Forever 21. "We see it as a standalone large opportunity. We want to build it as a large independent business in the long term," he said. Globally the label is known for its large retail stores and its ability to serve up bargain fare for a generation constantly on the look-out for new trends. The brand is also seen as a typical American success story, the journey from a single store set up by Korean immigrants into a multi-million dollar global chain is the stuff of many case studies. However in recent years as digital marketplaces have altered the retail landscape, the label has seen market realities change and has cut down on the size and number of its stores. In India, the proliferation of e-commerce players has been a big disruptor too; by offering a wider choice of styles and bringing in labels that would otherwise been out of bounds in the country, it has changed consumer behaviour and large chains have had to struggle to understand the shift. However, on the plus side for traditional retail chains, digital marketplaces have helped expand the market for fashion, especially among young urban women and teens. Possibly global labels such as Forever 21, Zara and H&M offer such chains a way in, as these brands have a high recall among buyers of fast fashion. The Birla group is not alone in looking for a foothold into this market. Landmark group's fashion chain Max has also come out with an in-house brand Runway for the same segment. Max has one store in Bengaluru and plans to set up seven to eight such stores. "Till three years ago, fast fashion was out of reach for Indian shoppers. Now with the advent of e-commerce, new brands launching and people travelling abroad, shoppers are getting used to it," said Vasant Kumar, managing director at Max Fashion. Kishore Biyani's Future Group is also looking to launch a fast fashion brand 'Cover Story' in Mumbai next month. "Indian companies who have manufacturing background and sourcing capabilities will do a good job in it," said Jaydeep Shetty, CEO of fashion chain Mineral (Future group has a stake in the company). Will Forever21 give the Birla group an advantage over the desi brands, which still have to establish themselves in this segment? Whatever the outcome, many believe that it will definitely lead to a tough battle on the streets. "Increased competition in fast fashion means cheaper clothes and cheaper inputs in merchandise. I think share of full price merchandise will reduce from 54 per cent to 47 per cent going forward," Shetty said. But he adds that it is illogical to presume Indian chains can compete with Zara or Forever 21 as they look at different demographics. Zara launches new designs twice a week and Forever 21 turns its inventory 14 times a year. "Even in western markets, nobody is able to compete with them successfully," he added. However, Devangshu Dutta, chief executive at Third Eyesight believes that fast fashion as a concept does not exist in the Indian market. "In Europe, customers line up every Wednesday or Thursday to buy a new style or line. But here, people wait for three to four months to get discounts on merchandise. You will get very few customers who are ready to pay a certain sum to buy a new style or new line," Dutta said. He said shoppers in the country are more value conscious than fashion conscious. For Forever 21 and the Birla group, it is critical that they learn the rules of the game fast enough, before the brutal world of teen fashion changes yet again.